My ideas for a 40's party come from the fact that I grew up watching old movies. I particularly loved the ones that came out of Hollywood during the war years. The Andrews Sisters, Abbott & Costello, lots of fun comedy, great songs and movies that just made you feel good. Of course now, as an adult, I know that those movies, like the ones created in the 1930's, were made to be uplifting so everyone could forget their problems. It is no wonder that I loved them! But let's take a page back from those great movies for ideas for a party! A big part of the forties was World War II. Use World War II as part of your party theme, by decorating with Americana (pull out those Fourth of July decorations) such as US Flags and bunting, and even some Uncle Sam posters! Adding some movie posters for the great films of the 1940's would be fun too. Don't forget the great big band music that came from the 1940's. You can purchase compilations online, or even hire a live band to perform, just like in the movies! A 1940s party should always include lots of great music from that era and if possible, dancing. As mentioned above, Hollywood was huge in the 1940's. How about have guests come dressed as a favorite celebrity of that era, or a character from one of the many films that came out during that time? That would be big fun! 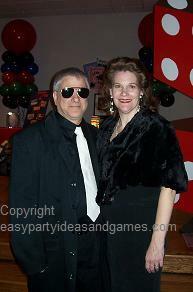 You could even include some Hollywood party ideas. What food was served at a party during these years? I honestly didn't know and had to go ask my mother! Remember that much of the war years was all about rationing. Parties included little finger foods, bites of this and that, also called "canapes." That makes it handy, because unless it is a seated dinner, I prefer serving finger foods at parties - they are easier to serve and easier to eat! This would make a great birthday party theme for anyone who loves this era, was born in the 40's, or grew up during that time. I think you'll love these great adult birthday party game ideas! Another idea for a party game could be a trivia contest, testing everyone's memory of the 1940s. More fun adult party game ideas.